TransferGo is an international money transfer company based in the United Kingdom, which is the home of many money transfer/remittance FinTechs. TransferGo doesn’t send money across borders. Instead, through an innovative digital account-to-account business model, its customers make local payments to it and it makes local payments to recipients. Money can be sent to 40+ countries. The mid-market rate is the midpoint between demand and supply for a currency. Mid-market, spot, and Google featured exchange rates are the fairest and best rates available to customers. TransferGo transacts at mid-market rates. Companies that don’t display real-time rates typically quote prices that reflect markups. For example, Western Union states, “Western Union also makes money from currency exchange,” and its rates will frequently deviate by 0.10 to 1 percent from spot rates. TransferWise is a top-rated money transfer company. It has financial services for people who travel, live, and work abroad. Sending money overseas with TransferWise is up to eight times cheaper than banks, and its borderless account allows users to hold, manage, and spend money in 20+ currencies. It provides the “easiest way to manage your money internationally.” Its excellent rates and low fees have propelled it to “unicorn” status (a unicorn is a privately held startup company that’s valued at over 1 billion dollars). I’ve been a TransferWise customer for a few years. I recommend it to others over alternatives such as PayPal, Xoom, XendPay, Payoneer, WorldRemit, and at least a dozen other online money transfer companies. TransferWise is a fantastic benchmark to use for exchange rate and cost comparisons. TransferGo and TransferWise use mid-market rates. Both companies are transparent about their fees and calculators are available on their homepages. Customers don’t need to login or create accounts to get estimates, unlike PayPal, for example. While TransferGo has a no-cost option, its other two delivery methods—express and standard—attract fees starting at £0.99. Also, express and standard delivery are subject to currency conversion fees of zero to 2.2 percent. All three options are not available for every country/destination. TransferWise uses a combination of percentage and fixed rates, for example, 0.6 percent of the amount that’s converted + 1.00 USD. Its fees differ for each country. TransferGo customers can send money from mainly EU countries, which is fantastic for sending pounds and euros. People outside of the EU, however, can only receive money transfers, for example, Americans, Canadians, and Indians. TransferWise customers can send and receive a variety of currencies. Therefore, TransferWise supports a lot more currencies than TransferGo. TransferGo supports single currency transactions. For example, someone in Germany can send euros to someone in France. TransferWise only supports currency conversions. I ran several currency conversion scenarios. 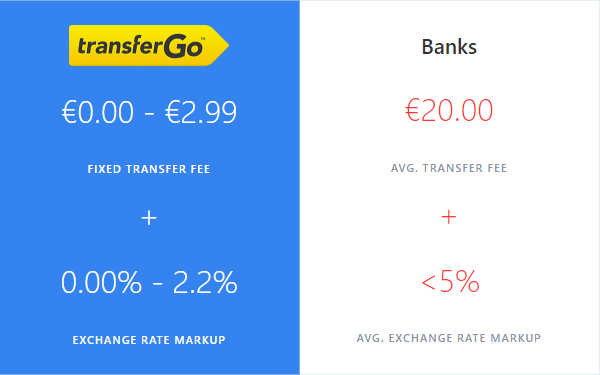 Given that both companies use mid-market rates, TransferGo will almost always beat TransferWise with its free delivery option. However, when using TransferGo’s standard and express options, TransferWise will usually do much better. TransferGo’s real-time rates and free money transfer option are excellent for customers. On the flip side, its express and standard delivery methods attract £0.99 to £2.99 plus conversion fees of up to 2.2 percent, which can get costly. Secondly, TransferGo is of very little use to people outside of Europe, which includes me. I hope the folks at TransferGo are working feverishly to support as many currencies as TransferWise, which would increase its value proposition and competitive edge. Taking supported currencies, rates, and fees into account, TransferWise is a much better option despite not having a cost-free transfer method. Alternatively, Revolut offers no-fee transactions at mid-market rates (some exceptions do apply).